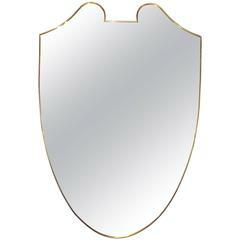 Sorry, Italian Brass Shield Mirror with Beaded Details is not currently available. Italian brass shield form mirror. Italian shield mirror, circa 1950. This long, ovular mirror has a shapely top that channels the shape of late 12th century heater shields. Octagonal bamboo surround mirror with brass details. Mid-Century goatskin mirror with brass detail Another Mid-Century marvel a lovely mirror in very good vintage condition with great brass details atop. A real beauty.